Contents: 60 cards and one Rulebook. Play Time: Less than 2 Minutes per game! Blink is a two-player card game recommended for ages seven and up. The goal is to be the first player to run out of cards in their draw pile and hand. Begin the game by shuffling the 60 card deck. Deal out the 60 cards to both players, forming two even stacks of 30. This forms each players’ draw pile. Each player places the top card of each pile face down in the center of the playing surface to two center piles. Both piles need to be accessible by both players. Each player draws three cards from their draw pile to form their hand. Each player simultaneously turns the card they placed into the center of the table (the center pile card) face up, and play begins. There are no turns. Fast as you can, play cards from your hand onto one of the center piles. To play a card onto a pile, it must match at least one characteristic of the card you are playing it onto—this includes number, color, or shape. 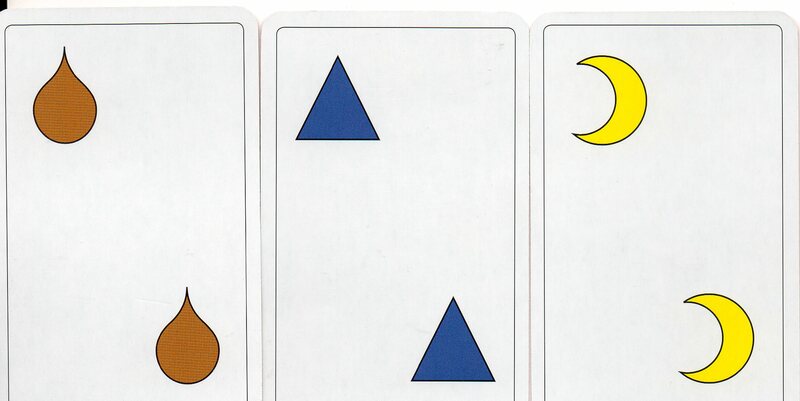 Cards can be played onto another card if they match color, shape, or number. You may only play one card at a time. Draw to replenish your hand during play. You cannot have more than three cards in your hand at any time. Winning: The first player to play all of the cards in their draw pile and hand wins. Special Rules: It is possible that no player will have a legal play. In this situation each player takes the top card from their draw pile and places it onto the center pile and play resumes. If one or more players do not have a draw pile, each player chooses a card from their hand and puts it into the center pile. Play resumes (Note, this could result in a win for one player, or a tie if both players have only one card in hand). Three and Four Player Blink: Set up the three player game as described above with an additional pile in the center. Players can only play cards onto the piles to their left or to their right, not all three piles. Play otherwise continues as normal. For four players, simply set up two separate two player games with the winner of each game advancing to the final round.